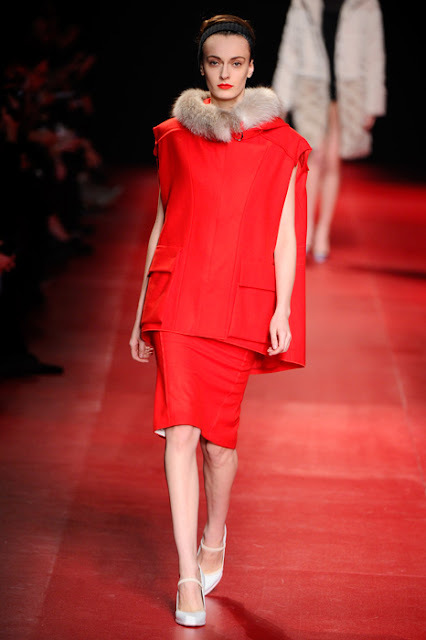 PARIS - Nina Ricci presented simple yet elegant collection during Paris Fashion Week Autumn/Winter 2013. The colour palette was toned, mainly black, white, and grey, with the occasional splash of bright red. What is your favourite look? Nina Ricci is a fashion house founded by Maria "Nina" Ricci and her son Robert in Paris in 1932. The brand rapidly expanded over the next few decades, thanks to its refined, romantic, and always feminine aesthetic. At one point, the house was so respectable that Andy Warhol designed its window displays. Nina Ricci is owned by the Spanish beauty and fashion group Puig since 1998.